Ah, has it really been nine years since Sin City burst upon the scene? Back in 2005, the trailers for Sin City looked like nothing I’d seen before, a phenomenal page-to-screen adaptation that captured the flavor of Frank Miller’s modern noir comic book series via the spendthrift imagination of filmmaker Robert Rodriguez. The look — blocky black and white graphics enlivened by bursts of color — remains embedded in my memory, along with a general disappointment that the story glorified old stereotypes without adding much more than a whiff of self-aware, modernist ridicule at its hoariness. In the years since then, the film industry has adapted many of the techniques pioneered by Rodriguez and his collaborators, resulting in a flood of movies in which actors must compete with their digitized surroundings. Rodriguez himself has maintained his independent stance while unleashing a series of movies — Planet Terror, Shorts, Machete, Machete Kills — that proudly display absolutely no growth in his creative talents. He strikes me as a hard-working craftsman, a filmmaker who enjoys what he is doing, and is content to remain exactly where he is, making genre movies that never rise above the level of action programmers. So maybe I should not be disappointed by Sin City: A Dame to Kill For, an average action programmer that looks different than most anything else made today, and plays much like every other action programmer made in the 1970s and 80s. The shame of it all is that Ms. Green, as well as Joseph Gordon-Levitt and Powers Boothe, are wasted in a movie that is entirely devoted to its look. 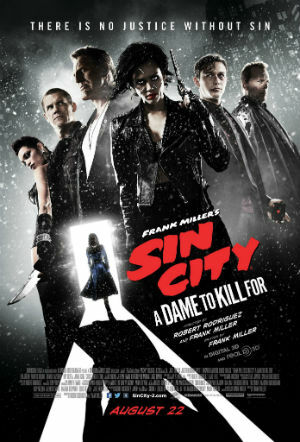 Sin City: A Dame to Kill For brings back tough guy Marv (Mickey Rourke), who is effective, and damaged dancer Nancy (Jessica Alba), who is not, as well as power-abusing Senator Roarke (Boothe) and others. The idea is, evidently, to mix characters who are vaguely memorable from the first movie with newer personalities, but in the seamy criminal world created by Miller, everyone talks the same, and after a short while the people fade into the background. What counts is the attitude, which is why Green, Gordon-Levitt, Boot, Rourke, Rosario Dawson, and Christopher Lloyd stand out, while the likes of Alba, Josh Brolin, Ray Liotta, Christopher Meloni, Jeremy Piven, Dennis Haysbert, and Jamie Chung do not. The first group of actors is comfortable hamming things up, while the secondary group gets lost because they underplay their roles. In this meticulously-landscaped environment, actors have to fight their way out of the background in order to make any kind of impression. The movie is structured to emphasize its episodic nature, but Rodriguez, who photographed and edited the movie, is not terribly interested in the final impact; he’s fascinated by the intrinsic value of the journey, which does not translate very well for the rest of mankind. The film opens wide in theaters across Dallas and Ft. Worth on Friday, August 22. Copyright 2010-17 Peter A. Martin. All rights reserved. No portions of this material may be used without the express written permission of the copyright holder.